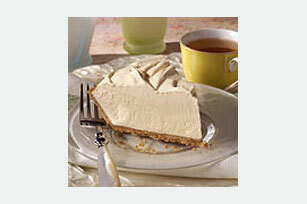 Whipped topping, vanilla low-fat yogurt and orange flavor drink mix are blended and frozen in a graham cracker crust for a frosty no-bake pie. Mix yogurt and drink mix in large bowl with whisk until mix is dissolved. Stir in COOL WHIP. Freeze several hours or until firm. Remove from freezer 15 min. before serving. Let stand at room temperature to soften slightly. Sweets can add enjoyment to a balanced diet, but remember to keep tabs on portions. This frosty pie serves 8. Stir in 1 ripe banana, mashed, with the yogurt and drink mix.